Each year we are honored to induct students who never had a Bar/Bat Mitzvah into the ranks of Iowa Hillel B'nei Mitzvahs. This honor is earned through countless hours of study and practice leading up to the big day. Each student reads from the Torah, leads a portion of the service, and gives their B'nei Mitzvah speech. Send this link to your parents or sign up yourself! 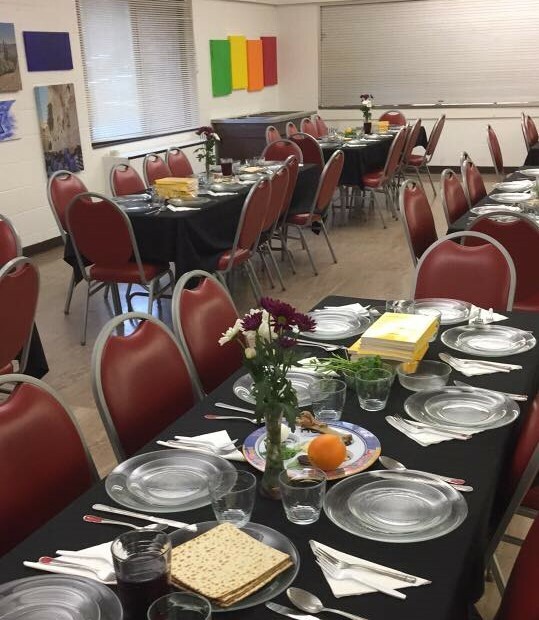 The times of the Seders for Passover 2018 is 8 P.M.; non-Seder dinners will be at 6:00 P.M., and lunches on Saturday and Sunday will be between 12 P.M.-2P.M. Weekday lunches will be between 11 A.M.-1 P.M. We are happy to accommodate anyone who cannot make the lunch or dinner times by saving a meal for you to grab earlier or later. We know how hectic everyone's schedules may be, so we are happy to work with anyone to make sure you can keep Passover with our tasty and kosher meals! We offer a variety of options for Pesach, including a full week meal plan, to anyone looking for kosher meals throughout the week. All our meals are prepared in our Certified Kosher kitchen, cleaned and free of chametz! We are also putting a restriction on chametz in the building starting 48 hours before the first seder. We ask all visitors to please respect the kashrut of the building and students keeping Passover during the holiday. For information on selling your chametz or buying shmurah matzah you can go through our neighbors at Iowa City Chabad.